After figuring out the GPIO pin names of the Orange Pi Zero expansion port it is relatively easy to configure any TFT display as a FBTFT device attached over the SPI bus, as long as you know the name of the chip used to drive the LCD screen. Here is a list of all the chips supported by the Linux kernel out of the box. The display I have is very similar to this 3.2″ Waveshare touch-screen display that uses the ILI9340 LCD driver (PDF) chip. It was only a matter of specifying the two GPIO pins used for DC (Data or Command) and RST (Reset) in addition to the SPI port. H2+ SPI bus 1 is connected to the display module SPI pins. where 8 stands for /dev/fb8. Does your lcd screen output the kernel messages during boot up or just show login prompt ? Have you been able to set led screen brightness using pwm ? It does show a few messages after the fb_ili9340 module is loaded and before the login screen. 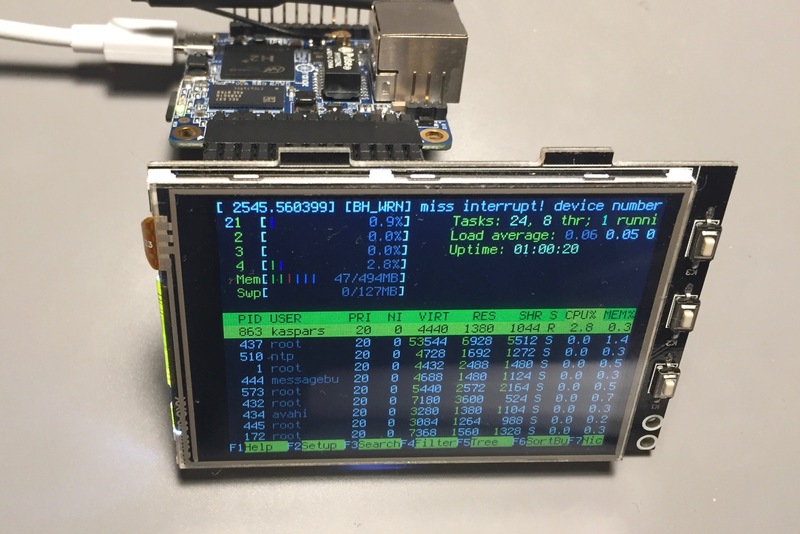 adafruit22a seems to be using the hx8340bn TFT driver chip which has a slightly different SPI init sequence. Did you get it working? Where did you buy your screen ? It should work with almost all single board computers since they all have SPI ports. You only need to know the pin mapping in the Linux kernel. Is it possible to run Android OS on Orange Pi Zero and use this display? I don’t know. Haven’t tried it with Android. No desire to try? Would be very interesting material. And unique! I was wondering if the same method can be applied for the 3.5 inch touch screen LCD module here. Sure, as long as it uses one of the supported TFT SPI-based driver chips (also linked in the post). Simply replace name=fb_ili9340 with the name of the chip you have on the module. Have you measured refresh rate? Nope. It would be interesting to know, though. Here is more information about fbtft and FPS. Thanks for sharing that Agge! Are you saying that supplying the extraargs argument it doesn’t work while using con2fbmap it does? Are you able to see any errors messages during the boot over UART? Did you add a space before the extraargs parameter in /boot/armbianEnv.txt? Should there be a space before extraargs ? Have to look into that tonight. Yes, there should be a space before extraargs. It probably halts at that line because of a formatting error. Hey. I’m having exactly the same issue. The screen image in my tft seems to be very unstable. It gets stuck very often, did you sorted the problem out at the end ? Not sure to be honest. You could try adjusting the SPI bus speed=16000000 value. have ili9340 2,4″ display at home, and pi zero with ext board on the way, looking to build a “internet radio” and “spotify connect” player by connecting external speakers – anyone has experience with this? any good tips on what software to use? Ideal internet radios as playlist of strem-urls, so just need some nice simple ui maybe? to control vlc? or any tips? and how to provide the spotify connect functionality (to show “play on xy”)? maybe even provide controls for this too? Maybe start with something very simple — cmus is a CLI music player so you don’t need to run the full desktop. hi, do you think can be used with this module? can’t find the chipset on that page, but it seems to work with standard raspbian. Yes, it should work just fine since it has compatible SPI pins. Hey, your guide is very helpful for LCD display with Armbian OS. I am trying to do the same with Lubuntu Image available on Orange pi zero website. It should be exactly the same as long as you know the TFT chip name, I think. Did you try it already? Does it work when you manually run the con2fbmap 1 8 command after doing sudo modprobe fbtft_device ...? It should be working before you add it permanently to the boot file. Hi, I’ve managed to get the kumantech 3.5 inch screen kinda working. But unfortunately it stops working a few seconds after booting. It hangs and doesn’t update the screen anymore. I’m testing it with a waveshare 3.2 inch display right now and this display hangs after a while, too. But this time it took several minutes before it stopped working. Do you have any idea what’s going wrong here? I’m on the latest Armbian Ubuntu xenial image. I’ve had the same issue before but I’m not sure how to solve it. You could try lowering the SPI bus speed setting speed=16000000. Hi, I am trying to use this via a 26-pin RasPi GPIO Extension board- ie one of those T-shaped adapters that breaks out all the GPIO pins onto a breadboard. My challenge is that the labelling on that doesn’t closely match anything else. Could you please explicitly say which OrangePi Zero GPIO pins you have mapped to each of the ili9341 pins? My particular display connects to the SPI bus #1 (PA15 is MOSI, PA16 is MISO, PA14 is CLK and PA13 is CS) and two additional pins at PA00 and PA03 for RST and DC. Please note that physical pin numbers are different from the pin names in the Linux kernel and the GPIO numbers that are mapped to those pins. See the expansion port table on this page for how they’re all mapped together. Both SPI modules are desactivated by default during the dtb fixup so in u-boot I’d to set: ‘setenv param_spidev_spi_bus 0’ before booting to have it activated and it worked. Thanks for sharing your findings, Fred! I’m sure others will be happy to learn it works with Orange Pi One. 1st is to say that to follow your tips, we need to use a “hand builded image” of Armbian (https://github.com/armbian/build) instead of the pre-compiled available images on site. This LCD (ili9340) or fbtft, in my case, was with blue and red colors swapped, and bgr=1 make it right again. Thanks for sharing your suggestions! I did use the pre-built Armbian images, though. Im using the prebuilt Arbian Jessie distro. Any idea what can be happening? Did you try one of the suggested solutions in this thread? First off thank you for a awesome guide, I have one question though, do you know how to get the pi to output the framebuffer of the video not the console? As mines just outputting the console at the moment not whats actually going on. Here is the Framebuffer guide for outputing all kinds of media. I haven’t used it personally so I won’t be able to comment on the specific OPi nuances. Can you use the display in gui mode? When it’s no gui it works fine. But after upgrading system to some GUI desktop environment, display goes black…? Anyone had similar issues? – before you start following a tutorial, you need to understand which kernel you are using. If the turial is written after jan 2017, and mentions adding an overlay in armbianEnv.txt, then it’s for kernel 4; if the tuto is before feb 2018, and does not mention altering armbianEnv.txt for SPI compatibility, author is using kernel 3. This is critical. – I got adressable LEDs working on both kernels, 3 and 4. Easier on 4. – SPI LCDs work only on kernel 3; I have spend days on kernel 4, just forget them; drivers exist, but they are broken. – check your FB number with a command like this: dmesg | grep ili | grep graphics | grep -i fb . I have seen people using 0, 1 and 8. Now, I have ili9486 working perfectly fine … with image Armbian_5.35_Orangepizero_Ubuntu_xenial_default_3.4.113 (kernel 3.4.113). This is super useful information, thanks for sharing!